Marbella is a boutique-style oceanfront condo community located in Boca Raton, FL. Marbella consists of a single 20-story luxury condominium building situated directly on the sand that offers 155 units with one- and two- bedroom floor plans. Condos for sale in Marbella range in size from 1,600 to 1,800 square feet of living space. Being just steps away from the crystal blue waters of the Atlantic Ocean, residents of Marbella enjoy South Florida condominium living at its absolute finest. Many of the condos for sale in Marabella have been recently renovated and updated to include many high-end features. Renovated condos in Marbella are now complete with gourmet kitchens with granite countertops, stainless steel appliances, and custom cabinetry, upgraded bathrooms, marble and hardwood flooring, crown molding, and spacious open layouts. With its premier oceanfront location, every condo in Marbella offers breathtaking views of the Atlantic Ocean, Intracoastal Waterway, and Lake Boca Raton. Originally built in 1975, Marbella condominium recently underwent major renovations. Renovations included extensive remodeling of the common areas, including a brand new designer-decoration lobby, installation of hurricane impact windows and doors in all units, and installation of a new infinity pool and fire pit. The maintenance fees at Marbella include trash removal, cable television, and maintenance of the building, common areas, and community amenities. Marbella is located just south of Palmetto Park Road directly on Boca Raton's gorgeous coastline. 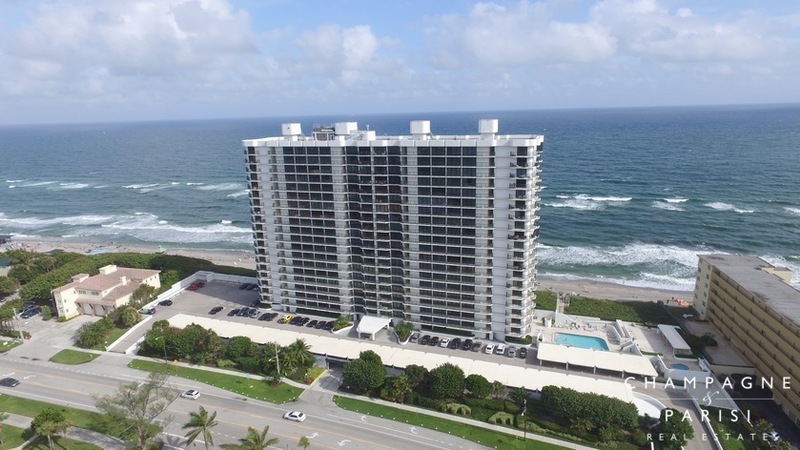 This condominium community is situated directly on the sand, yet just steps away from all the excitement happening in the heart of downtown Boca Raton. This premier location allows residents to enjoy South Florida living to the fullest with the convenience of being near all of the area's finest shopping, dining, and entertainment options, as well as the beautiful beaches just steps from the front door. If Marbella sounds like a place you would love to call home, you may want to visit nearby luxury oceanfront condominiums such as Chalfonte and Sabal Shores which also offer luxury oceanfront living at its finest in Boca Raton. If you are interested in purchasing a Marbella condo for sale or would like to learn about nearby luxury condominiums for sale in Boca Raton, please call us at 561-998-9015. You may also contact us by completing our short online contact form provided below and one of our expert agents will promptly reach out to assist you. We at Champagne & Parisi Real Estate would be delighted to assist you in finding your next dream condo in Boca Raton, FL! Also, please consider registering for a free account which will enable you to receive automatic email notifications when new properties hit the market in Boca Raton, FL.